We are delighted that you have chosen to use EvolveAR and our other products and services. We have carefully designed our 'Terms of Service, to make you understand the rules and regulations that govern our relationship with you. These Terms of Service form a legally binding contract between you and EvolveAR part of Evolve Innovative Solutions Pvt. Ltd., so please do read them carefully. Evolve Innovative Solutions Pvt. Ltd. ("EvolveAR", "our", "we", or "us") enables people to view augmented reality and virtual reality content as a part of its business advertising and marketing campaigns. 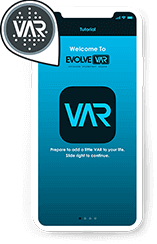 Please read our Terms of Service so you understand what’s up with your use of EvolveAR. You agree to our Terms of Service ("Terms") by installing, accessing, or using our apps, services, features, software, or website (together, "Services"). Registration: You must register for our Services using accurate data, provide your current mobile phone number and email address, and, if you change it, update this using our in-app change number/email id feature. You agree to receive text messages and phone calls (from us or our third-party providers) with codes to register for our Services. Address Book: You provide us with the phone numbers of EvolveAR users and your other contacts in the mobile phone address book on a regular basis. You confirm you are authorised to provide us such numbers to make use of within our Services. Age: You must be at least 13 years old to use our Services (or such greater age required in your country for you to be authorised to use our Services without parental approval). In addition to being the minimum required age to use our Services under applicable law, if you are not old enough to have an authority to agree to our Terms in your country, your parent or guardian must agree to our Terms on your behalf. Devices and Software: You must provide certain devices, software, and data connections to use our Services, which we otherwise do not supply. For as long as you use our Services, you consent to download and install updates to our Services, including automatically. You must access and use our Services only for legal, authorized, and acceptable purposes. You will not use (or assist others in using) our Services in ways that: (a) violate, misappropriate, or infringe the rights of EvolveAR, our users, or others, including privacy, publicity, intellectual property, or other proprietary rights; (b) are illegal, obscene, defamatory, threatening, intimidating, harassing, hateful, racially, or ethnically offensive, or instigate or encourage conduct that would be illegal, or otherwise inappropriate, including promoting violent crimes; (c) involve publishing falsehoods, misrepresentations, or misleading statements; (d) impersonate someone; (e) involve sending illegal or impermissible communications such as bulk messaging, auto-messaging, auto-dialing, and the like; or (f) involve any non-personal use of our Services unless otherwise authorized by us. You must not (or assist others to) access, use, copy, adapt, modify, prepare derivative works based upon, distribute, license, sublicense, transfer, display, perform, or otherwise exploit our Services in impermissible or unauthorized manners, or in ways that burden, impair, or harm us, our Services, systems, our users, or others, including that you must not directly or through automated means: (a) reverse engineer, alter, modify, create derivative works from, decompile, or extract code from our Services; (b) send, store, or transmit viruses or other harmful computer code through or onto our Services; (c) gain or attempt to gain unauthorized access to our Services or systems; (d) interfere with or disrupt the integrity or performance of our Services; (e) create accounts for our Services through unauthorized or automated means; (f) collect the information of or about our users in any impermissible or unauthorized manner; (g) sell, resell, rent, or charge for our Services; or (h) distribute or make our Services available over a network where they could be used by multiple devices at the same time. Our application allows you to creatively build animations including using face photographs for your avatars and dubbing the animations with voice and background of your choice. We do not assume responsibility for the nature of these images and sounds including any copyright violations that might occur. Should there be any infringements in this regard, you may be required by the respective owners to edit or remove the offending content. You are responsible for keeping your device and your EvolveAR account safe and secure, and you must notify us promptly of any unauthorised use or security breach of your account or our Services. Our Services may allow you to access, use, or interact with third-party websites, apps, content, and other products and services. For example, you may choose to interact with a share button on a third party’s website that enables you to send information to your EvolveAR contacts. Please note that when you use third-party services, their own terms and privacy policies will govern your use of those services. Your Rights: EvolveAR does not claim ownership of the information that you submit for your EvolveAR account or through our Services. You must have the necessary rights to such information that you submit for your EvolveAR account or through our Services and the right to grant the rights and licenses in our Terms. EvolveAR’s Rights: We own all copyrights, trademarks, domains, logos, trade dress, trade secrets, patents, and other intellectual property rights associated with our Services. You may not use our copyrights, trademarks, domains, logos, trade dress, patents, and other intellectual property rights unless you have our express permission. We may terminate your EvolveAR account if you repeatedly infringe the intellectual property rights of others. You use our services at your own risk and subject to the following disclaimers. We are providing our services on an “as is” basis without any express or implied warranties, including, but not limited to, warranties of merchantability, fitness for a particular purpose, title, non-infringement, and freedom from computer virus or other harmful code. We do not warrant that any information provided by us is accurate, complete, or useful, that our services will be operational, error free, secure, or safe, or that our services will function without disruptions, delays, or imperfections. We do not control and are not responsible for, controlling how or when our users use our services or the features, services, and interfaces our services provide. We are not responsible for and are not obligated to control the actions or information (including content) of our users or other third parties. You release us, our subsidiaries, affiliates and their directors, officers, employees, partners, and agents (together, the “ parties”) from any claim, complaint, cause of action, controversy, or dispute (together, “claim”) and damages, known and unknown, relating to, arising out of, or in any way connected with any such claim you have against any third parties. You waive any rights you may have under california civil code §1542, or any other similar applicable statute or law of any other jurisdiction, which says that: a general release does not extend to claims which the creditor does not know or suspect to exist in his or her favor at the time of executing the release, which if known by him or her must have materially affected his or her settlement with the debtor. You agree to defend, indemnify, and hold harmless the EvolveAR Parties from and against all liabilities, damages, losses, and expenses of any kind (including reasonable legal fees and costs) relating to, arising out of, or in any way in connection with any of the following: (a) your access to or use of our Services, including information provided in connection therewith; (b) your breach or alleged breach of our Terms; or (c) any misrepresentation made by you. You will cooperate as fully as required by us in the defence or settlement of any Claim. Forum and Venue: If you are a EvolveAR user located in the United States or Canada, the “Special Arbitration Provision for the United States or Canada Users” section below applies to you. Please also read that section carefully and completely. If you are not subject to the “Special Arbitration Provision for the United States or Canada Users” section below, you agree that you will resolve any Claim you have with us relating to, arising out of, or in any way in connection with our Terms, us, or our Services (each, a “Dispute,” and together, “Disputes”) exclusively in the United States District Court for Milwaukee district of Wisconsin or a state court located in Milwaukee County in Wisconsin, and you agree to submit to the personal jurisdiction of such courts for the purpose of litigating all such Disputes. Governing Law: The laws of the State of Wisconsin govern our Terms, as well as any Disputes, whether in court or arbitration, which might arise between EvolveAR and you, without regard to conflict of law provisions. Availability of Our Services: Our Services may be interrupted, including for maintenance, repairs, upgrades, or network or equipment failures. We may discontinue some or all of our Services, including certain features and the support for certain devices and platforms, at any time. Events beyond our control may affect our Services, such as events in nature and other force majeure events. Unless a mutually executed agreement between you and us states otherwise, our Terms make up the entire agreement between you and us regarding EvolveAR and our Services and supersede any prior agreements. e may ask you to agree to additional terms for certain of our Services in the future, which will govern to the extent there is a conflict between our Terms and such additional terms. Our Services are not intended for distribution to or use in any country where such distribution or use would violate the local law or would subject us to any regulations in another country. We reserve the right to limit our Services in any country. You will comply with all applicable U.S. and non-U.S. export control and trade sanctions laws (“Export Laws”). You will not, directly or indirectly, export, re-export, provide, or otherwise transfer our Services: (a) to any individual, entity, or country prohibited by Export Laws; (b) to anyone on U.S. or non-U.S. government restricted parties lists; or (c) for any purpose prohibited by Export Laws, including nuclear, chemical, or biological weapons, or missile technology applications without the required government authorizations. You will not use or download our Services if you are located in a restricted country if you are currently listed on any U.S. or non-U.S. restricted parties list, or for any purpose prohibited by Export Laws, and you will not disguise your location through IP proxying or other methods. Our Terms are written in English (U.S.). Any translated version is provided solely for your convenience. To the extent, any translated version of our Terms conflicts with the English version, the English version controls. We always appreciate your feedback or other suggestions about and our Services, but you understand that we may use your feedback or suggestions without any obligation to compensate you for them (just as you have no obligation to offer them). PLEASE READ THIS SECTION CAREFULLY BECAUSE IT CONTAINS ADDITIONAL PROVISIONS APPLICABLE ONLY TO OUR UNITED STATES AND CANADA USERS. IF YOU ARE A USER LOCATED IN THE UNITED STATES OR CANADA, IT REQUIRES YOU TO SUBMIT TO BINDING INDIVIDUAL ARBITRATION OF ALL DISPUTES, EXCEPT FOR THOSE THAT INVOLVE INTELLECTUAL PROPERTY DISPUTES AND EXCEPT THOSE THAT CAN BE BROUGHT IN SMALL CLAIMS COURT. THIS MEANS YOU ARE WAIVING YOUR RIGHT TO HAVE SUCH DISPUTES RESOLVED IN COURT BY A JUDGE OR JURY. THIS SECTION ALSO LIMITS THE TIME YOU HAVE TO START AN ARBITRATION OR, IF PERMISSIBLE, A COURT ACTION. FINALLY, THIS SECTION WAIVES YOUR RIGHT TO HAVE YOUR DISPUTE HEARD AND RESOLVED AS A CLASS ACTION, CLASS ARBITRATION, OR A REPRESENTATIVE ACTION. Federal Arbitration Act. The United States Federal Arbitration Act governs the interpretation and enforcement of this “Special Arbitration Provision for the United States or Canada Users” section, including any question whether a Dispute between EvolveAR and you is subject to arbitration. Agreement to Arbitrate for EvolveAR Users Located in the United States or Canada. For EvolveAR users located in the United States or Canada, EvolveAR and you each agree to waive the right to a trial by judge or jury for all Disputes, except for the Excluded Disputes. EvolveAR and you agree that all Disputes (except for the Excluded Disputes), including those relating to, arising out of, or in any way in connection with your rights of privacy and publicity, will be resolved through final and binding arbitration. EvolveAR and you agree not to combine a Dispute that is subject to arbitration under our Terms with a Dispute that is not eligible for arbitration under our Terms. The arbitration will be administered by the American Arbitration Association (AAA) under its Commercial Arbitration Rules in effect at the time the arbitration is started, including the Optional Rules for Emergency Measures of Protection and the Supplementary Procedures for Consumer-Related Disputes (together, the “AAA Rules”). The arbitration will be presided over by a single arbitrator selected in accordance with the AAA Rules. The AAA Rules, information regarding initiating a Dispute, and a description of the arbitration process are available at www.adr.org. The arbitrator will decide whether a Dispute can be arbitrated. The location of the arbitration and the allocation of fees and costs for such arbitration shall be determined in accordance with the AAA Rules. Notwithstanding the AAA Rules, we will reimburse you for all the AAA administrative fees in Disputes that are subject to the Supplementary Procedures for Consumer-Related Disputes, unless the arbitrator determines that a Dispute was filed for purposes of harassment or is patently frivolous. Small Claims Court: As an alternative to arbitration, if permitted by your local “small claims” court’s rules, you may bring your Dispute in your local “small claims” court, as long as the matter advances on an individual (non-class) basis. Time Limit to Start Arbitration: You and we agree that for any Dispute (except for the Excluded Disputes) you and we must commence an arbitration proceeding within one year after the Dispute first arose; otherwise, such Dispute is permanently barred. This means that if you or we do not commence an arbitration within one year after the Dispute first arose, then the arbitration will be dismissed because it was started too late. No Class Actions, Class Arbitrations, or Representative Actions for Users Located in the United States or Canada. We and you each agree that if you are a EvolveAR user located in the United States or Canada, each of we and you may bring Disputes against the other only on its or your own behalf, and not on behalf of any other person or entity, or any class of people. We and you each agree not to participate in a class action, a class-wide arbitration, Disputes brought in a private attorney general or representative capacity, or consolidated Disputes involving any other person or entity in connection with any Dispute. Severability: If the prohibition against class actions and other Disputes brought on behalf of third parties are found to be unenforceable for a Dispute, then all of the provisions above under the caption “Special Arbitration Provision for the United States or Canada Users” will be null and void as to that Dispute. A place to File Permitted Court Actions: If you opt out of the agreement to arbitrate, if your Dispute is an Excluded Dispute, or if the arbitration agreement is found to be unenforceable, you agree to be subject to the “Forum and Venue” provisions in the “Dispute Resolution” section set forth above. Accessing EvolveAR’s terms in different languages: To access our Terms in certain other languages, change the language setting for your EvolveAR session. If our Terms are not available in the language you select, we will default to the English version.